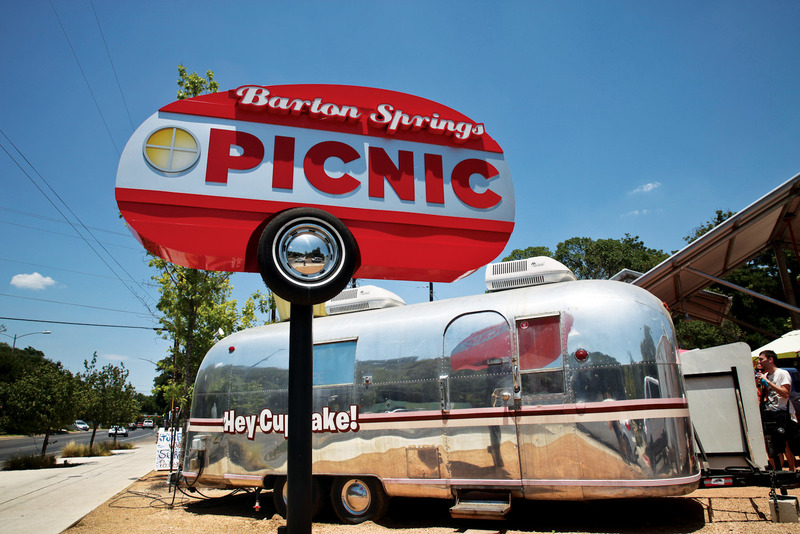 Barton Springs food truck park - an Austin must (photo: Steve Madgwick). Portion sizes at Franklin Barbecue are like all things in Texas - big! Austin, Texas, comes alive at night. 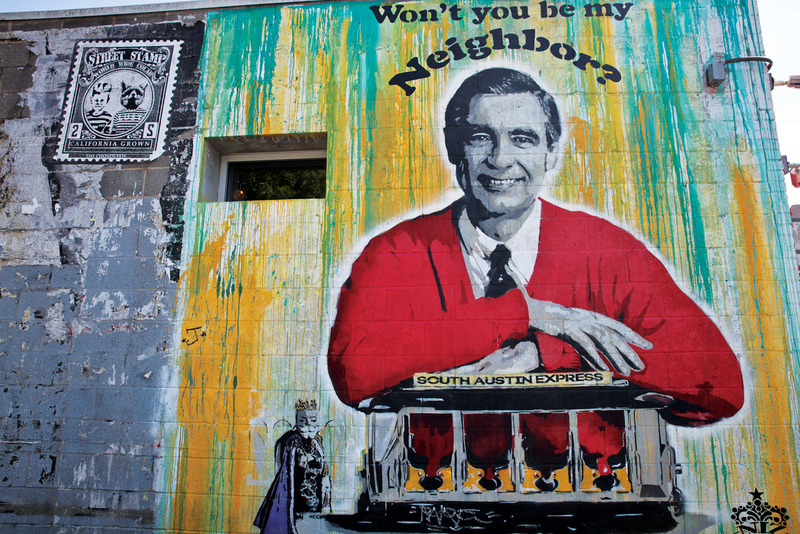 Street art in South Congress (photo: Steve Madgwick). Italian Creole at East Side Showroom. 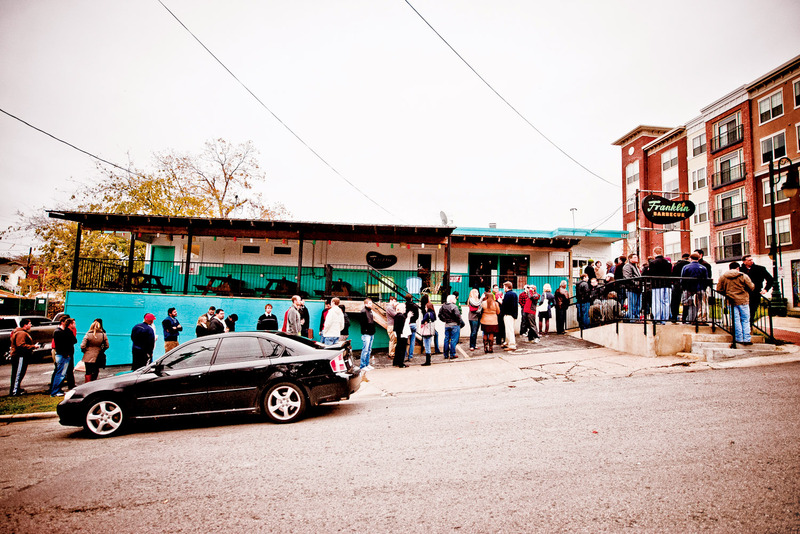 The lineup for smoked meats at Franklin Barbecue. Pick up vintage Americana at Roadhouse Relics. Shopping for rare finds at Waterloo Records. Repeat after me, Austin is not in California. Texas’s paradoxical capital city shares landscape and a hot, hot climate with all of the Lone Star’s megatropolises, but in every single other way she is the weird, cool, progressive and estranged little sister of Houston and Dallas. Wild-child little sis’s philosophy bleeds unfettered West Coast joie de vivre, informed by a painfully hip pastiche of progressive ideals and movements from the globe’s most enlightened enclaves. She has never wanted to live on the west or east coasts, mind you. Austin embraces her Texasness but refuses to be defined by its sometimes narrow perspectives on the world outside the good old US of A. To be an Austinite is to celebrate music, food and the outdoor lifestyle; then mash these all together and see what comes out at the other end. It’s almost 38 degrees Celsius in the shade and only a hint past 9am on a weekday morning. A busker strums odes to Creedence Clearwater Revival purposefully on an acoustic guitar as weathered as he is. I watch from behind the glass, in the air-conned sanctuary of South Congress Cafe, fighting a difficult decision: the migas (a breakfast of eggs, corn tortillas, jalapeños, three cheese blend, refried black beans and a smoked Gouda potato pancake) or the carrot cake French toast. Or, indeed both? Except for his Brad-Pitt-in-Thelma & Louise white cowboy hat and mirrored aviators the busker’s not fussed about finding shade. Even though the business day has well and truly begun, he plays for a growing queue outside this popular cafe. The collegiate and older-looking crowd squawks and chatters enthusiastically, in a furnace of a day that would force a European city into a siesta. Still there five hours later in the maddening heat, the cowboy feeds from the city’s energy, like many pilgrims to Austin’s frankly mighty music scene that for many maketh the city. But for an optimistic generation flooding to this city, music is only one in a medley of elements that makes Austin the south’s coolest capital (which is a lot easier to get to for Australians since Air New Zealand began Sydney-Auckland-Houston direct flights in late 2015). An intensely noticeable thing about Austin is what you don’t notice; it’s not exactly a no-franchise city so much as one that embraces smaller scale, local enterprises to the nth degree. Personality-rich precincts have sprouted in unlikely inner-city enclaves, run by the people for the people. Close to downtown, East Side is a hipster crèche: channelling the Shoreditch and Williamsburg vibe with a trendy Texan twist. 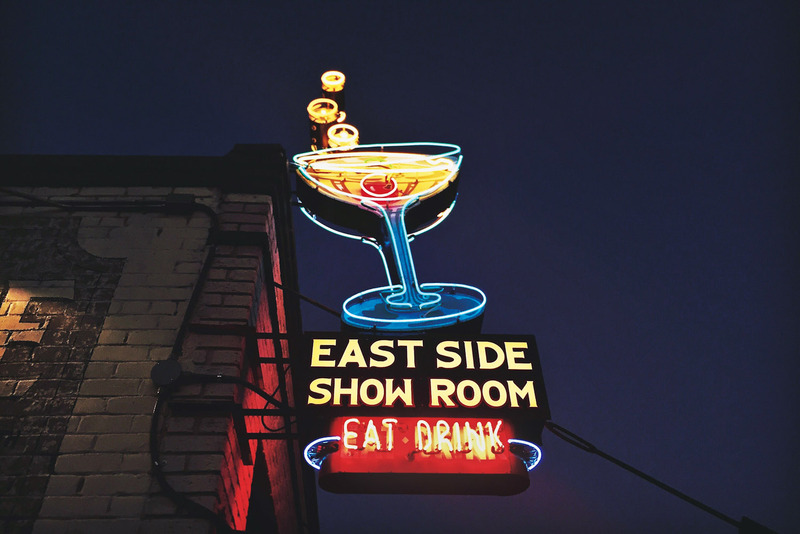 Old shops, boarded up for years, are now modish bars and galleries, such as the East Side Showroom, which purveys Creole Italian food and crafty cocktails, and the Whitehorse Saloon, which plays Texas Blues and serves whisky on tap. Shopping Austin-style is the antithesis of the US mega-mall mentality, if you know where to look. South Congress is the place to congress for proudly Texan merchandise in vibrantly hued boutiques. Limbo Jewellery is good for off-the-wall Americana, kitschy gifts, quirky but pricey Western-wear, and bespoke jewellery. 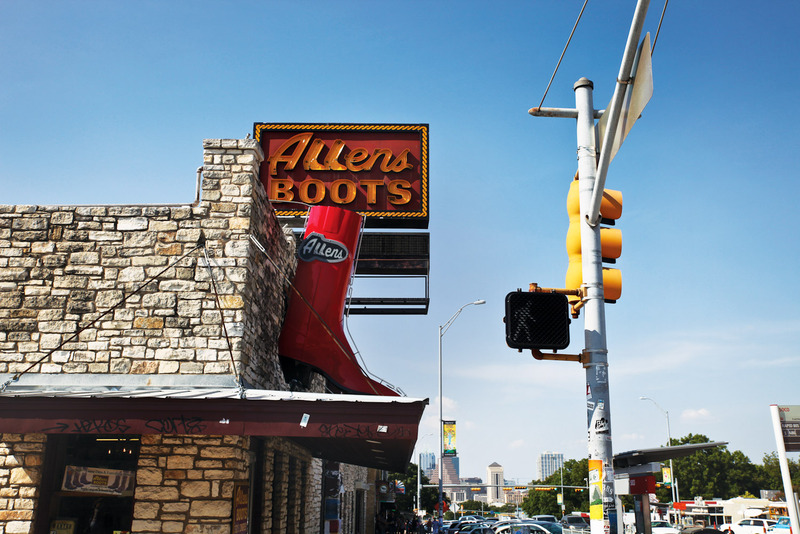 Allens Boots is a footwear fetish fantasy incarnate, with country miles of shelves (five high) stacked with thousands of pairs; from classic cowgirl to downright disco. Head to Goorin Bros for dashing headwear, from vintage, boaters and fedoras (but no cowboy hats). To complete your SXSW get-up, browse Lucy in Disguise with Diamonds, a costume shop where Bob Dylan used to accessorise. The odd semi-celebrity still drops by semi-regularly too: Ginger Spice a few days before me apparently. 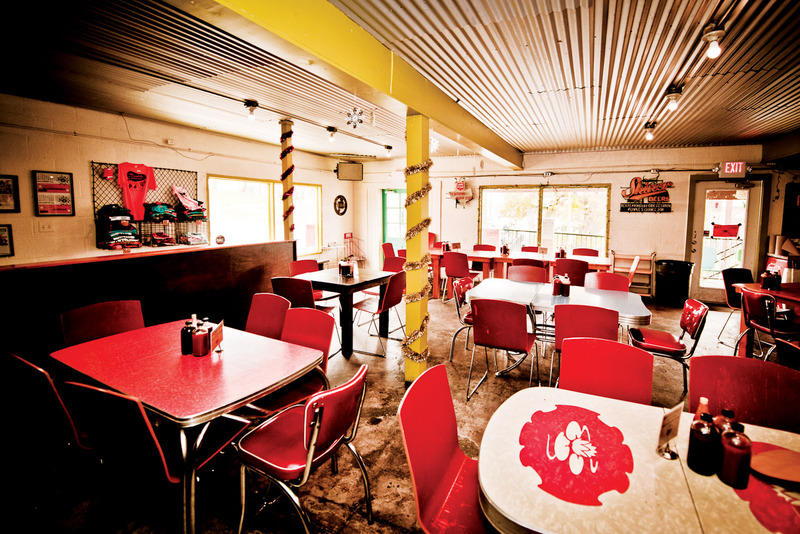 Cap off a couple of laps of South Con with a Mexican vanilla or amaretto cheesecake ice-cream at Amy’s Ice Cream, an entrée for an afternoon of socialising Austin-style. 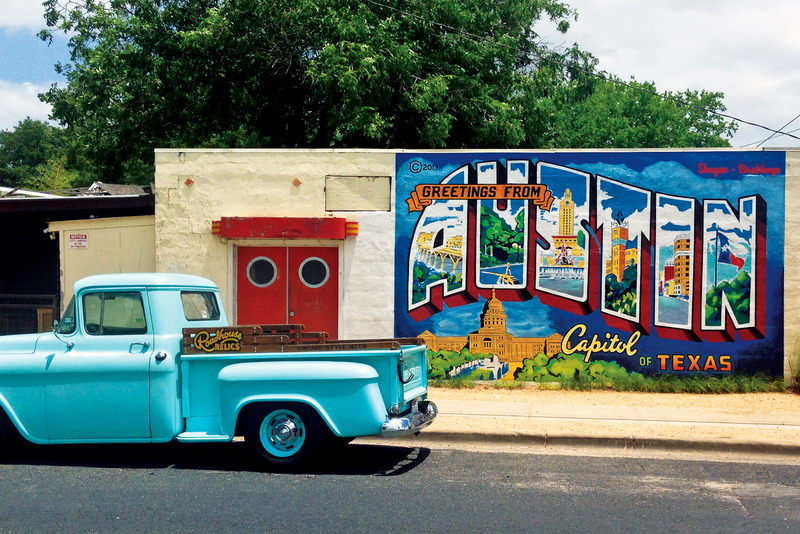 You’ll hear ‘Live Music Capital of the World’ bandied around in Austin for a couple of reasons. First, because the city has trademarked this as an official motto. Second, depending on your musical proclivities, it could be true. Austin hosts a couple of seriously respected festivals, South by Southwest (SXSW), which incorporates film and media, and Austin City Limits, which vacuums in musicians from many styles and brings in around 450,000 punters too. The regular live music scene follows you around any path you take in the city; so omnipresent it feels like someone is pulling a musical Truman Show on you, with the bands packing up and sprinting to the next venue before you get there. There are around 250 live music venues shoehorned into the city – apparently only Las Vegas has more music venues per capita in North America. 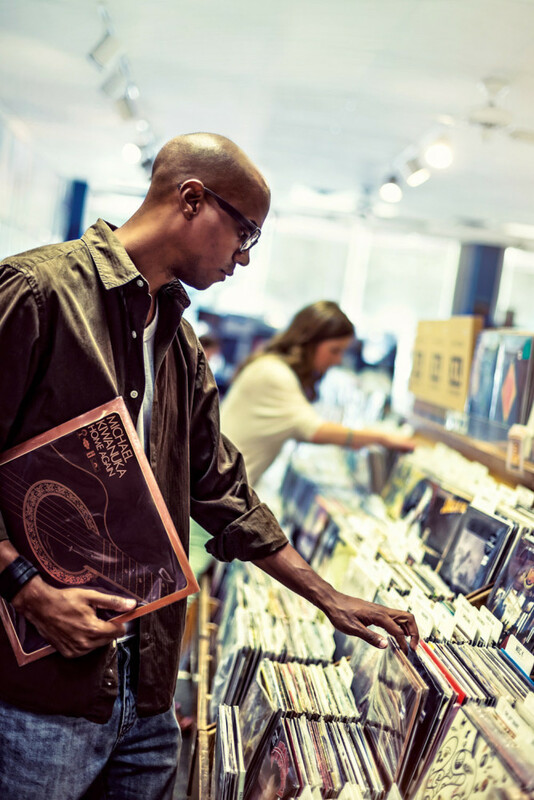 You’ll stumble across nightly tunes in luxury hotels, such as the historic and supposedly haunted The Driskill, convenience stores, and an ensemble of cafes, such as Jo’s Coffee on South Congress. The airport even squeezes in six stages and sometimes 20 shows a week. This musical concentration manifests in countless ways. For vinyl devotees, for example, heroically hip Waterloo Records stocks LPs that you never thought you could find and, of course, it also has a bandstand. The live-music caveat here is that you must do your research and pick the right venue for your genre of choice. Sixth Street is a sound place to start for more established music hubs, such as the Continental Club, which has been grinding out blues and roots since 1957. For a jazz fix, simply head upstairs. Alt-country – country rebooted for the 21st century – and bluesy rock is everywhere (in step with the city’s unofficial patron saint Stevie Ray Vaughan), but Austin throws out genuine genre diversity too. Case in point: Big Band Night every Wednesday at the Elephant Room on Congress (arrive early). Is it a house or is it a bar? Nothing is more uniquely Austin than its Bungalow Bars: charming 1930s inner-city houses that have been converted into barely signed laid-back undercover saloons. The concept was sparked by ‘vivacious nightclub entrepreneur’ Bridget Dunlap, herself a classic Austin success story. Concentrated in downtown Rainey Street village, these bars feature intimate spaces and open beer garden-style backyards. Swill craft beer on the porch or perhaps partake in ping pong on the lawn. Many of the bungalows are dog-friendly and serve food, so they’ve become local institutions in a short time, and natural hot-spots for the SXSW contingent. Each bungalow wears its own style, so wander along leafy Rainey Street to choose which one best fits you. The clue is often in the name: Craft Pride (craft beer central) and G’Raj Mahal Cafe (which serves Indian food) are sound reference spots for bungalow virgins. Perhaps no trend in this trend-nursery is more embraced than food trucks; there are around 600 in the city (around 30 of which are top-notch), outnumbering Austin’s bricks-and-mortar restaurants. Food truck hack for beginners: while some set up in different spots every day, others permanently coalesce in designated food trailer parks, such as the fab Barton Springs. 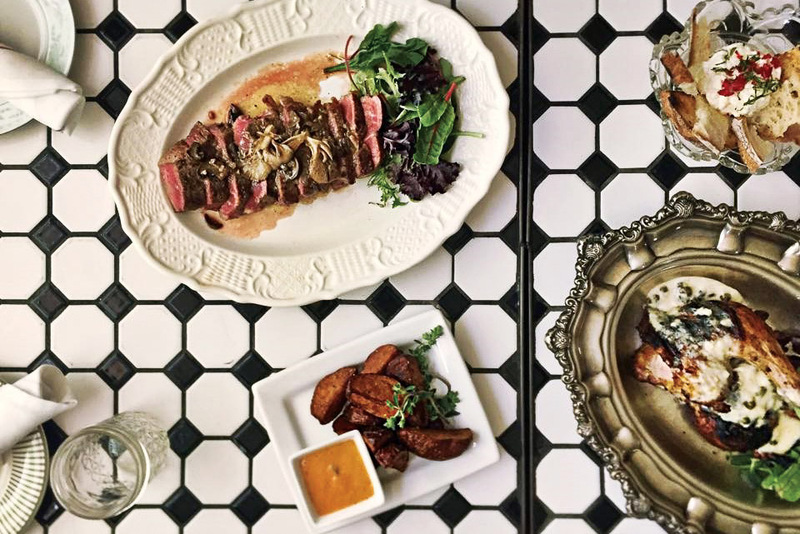 Try Veracruz for fish tacos; Micklethwaite for ‘craft meat’ barbecue; Hey!… You Gonna Eat or What? is known for ‘inventive sandwiches’ and the insulting slogans emblazoned on the truck; Chi’lantro and East Side King for Asian fusion. Of course, there are plenty of Tex-Mex options too for breakfast tacos and the like. For the best barbecue joints in town (rolling or stationary), just follow the sweet smoky aromas that tend to make other aroma-dvertisements (à la KFC) seem primitively grotesque by comparison. 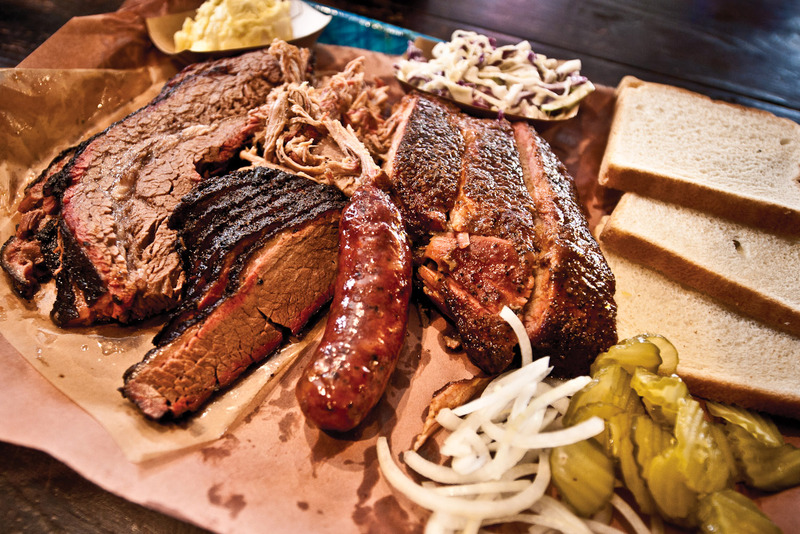 If you trust the on-the-pulse locals, Austin’s hottest restaurant (either truck or bricks-and-mortar) is Franklin Barbecue. This is barbecue in the finest Southern ‘pit master’ style, a seminal part of the brisket renaissance. It occupies a somewhat rustic (read underwhelming) building, totally recognisable by the line of people glued outside in the morning. Don’t be afraid of lining up in Austin – it is an essential part of the outdoorsy culture and integral to the social scene. In food, as in life, there’s always tomorrow in Austin – you’ll just have to line up that teensy bit earlier. Don’t leave it too long, though, things evolve at a frightening pace in the supernova of the Lone Star state. Air New Zealand has five return flights a week from Sydney to Houston via Auckland.